We live in a fallen world. It’s not hard to see this. All we have to do is look around and we will quickly see the results of sin on all creation; decay, disaster, tragedy, sickness, and ultimately death. Between October 17, 2015 and January 6, 2016 the faith family at Magnolia Baptist Church has experienced, either directly or indirectly, the passing of three individuals. One was an 8yr old girl, one a 34yr old man, and one a 69yr old man. I think there are three very important lessons to be learned from their lives and their passing. Death does not discriminate! It does not matter whether we are young or old, physically healthy or sick, in the beginning, prime, or latter part of our life, death will visit us all. Death does not choose based on popularity, education level, ethnicity, or socio-economic status. Death has no criteria. Death will not be denied! There is nothing we can do to avoid death. 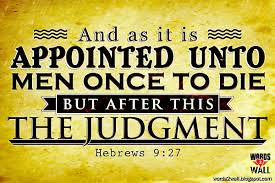 Hebrews 9:27a (HCSB) says “it is appointed for people to die once”. We can eat right, we can exercise every day, we can do anything and everything we know to do to live the healthiest life possible, but in the end we will all die. This may seem like morbid thinking, but I believe it is good to be reminded of the inevitability of death and the mortality of our physical bodies from time to time. Death has been defeated! Death is the result of sin and it is an enemy. Romans 6:23 says, “For the wages of sin is death, but the gift of God is eternal life in Christ Jesus our Lord.” Apart from Christ we will experience physical death and we will also experience an eternal death in Hell, but when Jesus died on the cross He paid the penalty for our sins and thus defeated death! Let the passing of these individuals be a reminder and a wake-up call to us all! No matter what we do we will all experience physical death one day, and we don’t know when that day will be. However, we don’t have to experience eternal death and separation from God for eternity in Hell. Jesus paid the debt that we owe when He shed His blood on the cross. Romans 10:9 says, “If you confess with your mouth that Jesus is Lord and believe in your heart that God raised Him from the dead, you will be saved.” Jesus is the ONLY way of salvation. Acts 4:12 says, “There is salvation in no one else, for there is no other name under heaven given to people by which we must be saved.” Just as death does not discriminate, neither does Christ. Everyone who calls on the name of the Lord will be saved (Romans 10:13). If you have yet to experience the saving grace of God I pray that your eyes will be opened today and you will call upon His name before it is too late. If you have already made this profession of faith then rest in the assurance of your salvation, and know that in Christ death has lost its sting and the grave has been overcome!